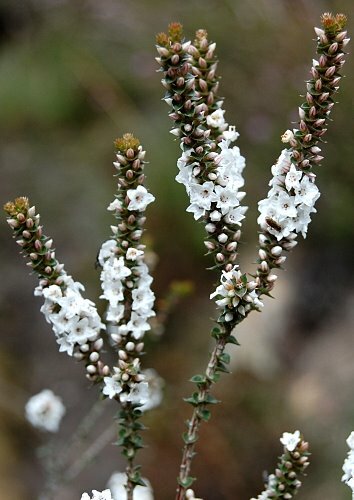 The Coral Heath (Epacris gunnii) is a fairly common shrub that may be found in wet heath to highland plateaus. This ornamentally attractive plant has heart-shaped leaves with a pointed tip and in it’s full flowering glory produces in a spike-like fashion, numerous flowers in the leaf axils. 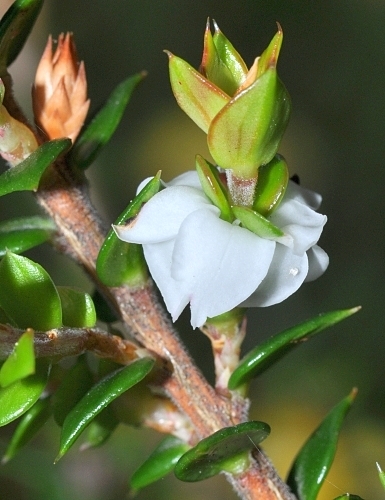 In the Royal Tasmanian Botanical Gardens there are many cultivated plants of the Coral Heath, and in particularly, a double form that produces small Camelia-like flowers. 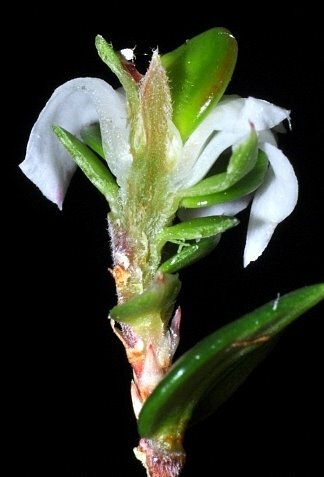 Even though I had the prior awareness the aberration of genetic mechanism of these double form plants, I was still pretty surprised when I stumbled on this strange phenomena of seeing a branch produce a ‘flower’, consisting of a whorl of petals, and have a new shoot growing out of the whorl of petals. Just to be sure I even sliced the stem and ‘flower’ longitudinally to make sure and indeed, the new shoot just grew continuously out of the whorl of petals. It is almost as thought the plant decided to make a flower but got sidetracked at the last minute and continued with vegetative shoot growth. Makes one think, what exactly are flowers? Many botanists must have pondered on this question. Thankfully we have some theories. Thus we learn in botany that flowers consists of four whorls of floral parts in the following order: sepals, petals, stamens (male parts) and carpels (female parts). All flowers are technically modifications of this scheme. And these whorls, some might be surprised to know, are actually modified leaves. What might come as an even bigger surprise is that the theory of flowers being modified leaves was actually conceived over two centuries ago in the brilliant mind of Johann Wolfgang Goethe, the famous German poet and philosopher. Goethe, in 1790, had no way of knowing the action of genes in the onset of flowering but his powers of observation would put many a scientist to shame. His insights were discussed his very aptly titled essay, Metamorphosis of Plants. The concept of flowers being modified leaves might seem very abstract, particularly given the fact that flowers seem to be so different from leaves. But therein lies the genius of plants. They transmutate. They morph. They make flowers from ‘leaves’. And here it seems our aberrant Coral Heath, leaves from flowers. 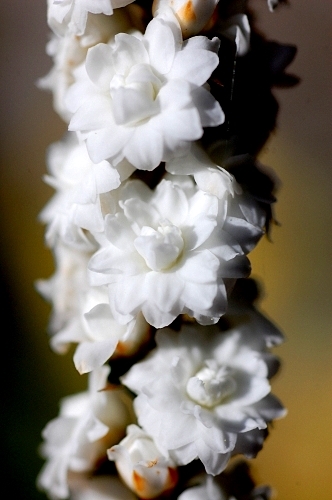 This entry was posted in Botanical Oddities, Botany, Hypotheses, Plant Morphology, Shrubs and tagged coral heath, double form Epacris gunnii, epacrids, Epacris, Epacris gunnii, Ericaceae, flowers, Goethe, Johann Wolfgang Goethe, leaves, metamorphosis, metamorphosis of plants, modified leaves. Bookmark the permalink.